Eleven years ago a group of Seventh Avenue Merchants decided to join together to improve their neighborhood. Plagued with crime and blight the Melrose District was struggling to stay alive. Armed with the mission to facilitate safety, community, revitalization and beautification, these pioneering business owners, through the help of the City of Phoenix’s Fight Back Program, partnered with the School of Architecture at Arizona State University to develop a master plan to revitalize the Melrose Curve. Relying solely on funds generated by grants and the blessings of the surrounding neighborhoods, the Melrose District slowly began to rebuild itself. One year after the Seventh Avenue Merchants Association incorporated, they held a “street fair” to commemorate the building of the first lighted canopies on Seventh Avenue. Originally consisting of a few six foot tables, a few dozen classic cars and a few hundred people the m7 Street Fair has grown to over 140 booths, food, rides and crafts for the kids, live music, over 200 classic cars, and almost 18,000 visitors. In ten years this award winning event has become one of the most anticipated events of the year! And this year is no different. 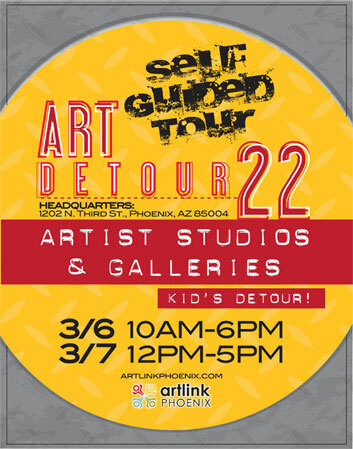 [Source: Rebecca Clark, Arizona Republic] — This Saturday and Sunday, about 15,000 people from across the Valley are expected to experience Phoenix’s art scene when they take part in the self-guided art walk and studio tour during the 22nd annual Art Detour hosted by Artlink. “We have such amazing artists that are now producing art in the Phoenix area, some of which are now receiving national and international attention,” said David Appleby, an Artlink spokesman. Jane Reddin, owner of Practical Art, on Central Avenue, has been a part of Artlink’s Detour since the first in 1989. Once a volunteer guide for the event, she has seen how it has expanded across central Phoenix. “Art Detour highlights that we have this extensive (arts) community that is all working together. It’s not just focused in one area. It’s not just Roosevelt Row, Grand Avenue, or Seventh Avenue/Melrose. It’s all of those things and more,” said Reddin. More than 100 artists and 60 galleries are expected to participate this year. A free shuttle will run through the weekend stopping at galleries along Roosevelt Row, the Melrose District, and the Grand Avenue area, and a few satellite locations, originating from the walk’s headquarters at Phoenix Center of the Arts at Third and Moreland streets. The city of Phoenix is working to simplify the process of adapting older buildings for new business uses on an all-new episode of Building Phoenix, premiering 8 p.m., Wednesday, Jan. 28, on Phoenix 11, the city’s news and information station available to Cox and Qwest Cable subscribers (for additional airdates and times, click here). 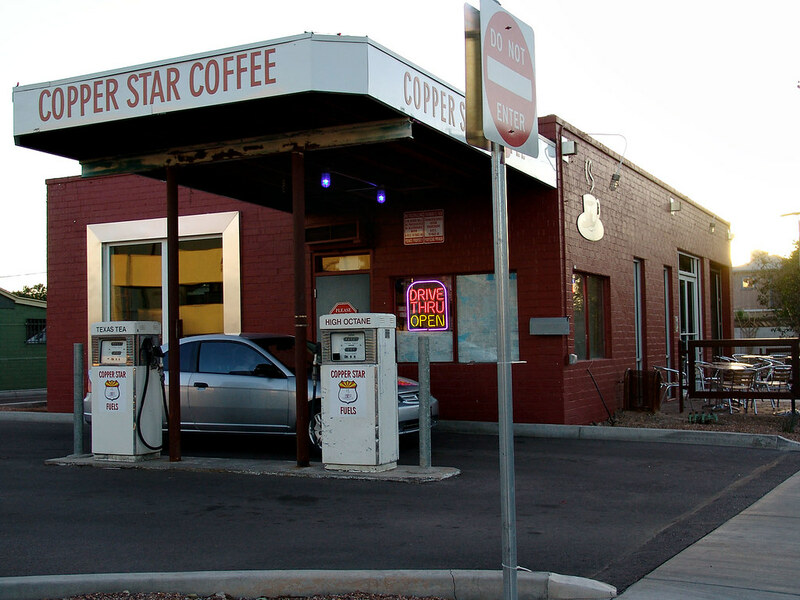 Program highlights: A 1940s firehouse in Sunnyslope becomes Bomberos Café and Wine Bar; coffee connoisseurs are filling up at Copper Star Coffee, housed within a vintage gas station in the Melrose on 7th Ave. area of midtown Phoenix (pictured at right); a former tire shop is transformed into Results Only, a facility to get pumped up and healthy; and the trendsetter who transformed a historic post office into Postino Wine Café is ready to do it again; plus appearances by Vice Mayor Tom Simplot and Councilwoman Maria Baier. “Building Phoenix” is a production of the city of Phoenix Development Services Department. Michael Hammett, host and executive producer, is an Emmy Award winner and former contributing reporter/producer for ABC 15’s Sonoran Living. The program will be streamed live during the premiere. The Building Phoenix show is available on-demand. [Source: Seventh Avenue Merchants Association] — The Seventh Avenue Merchants Association is now accepting vendor applications for the 8th annual Melrose on 7th Street Fair, March 7, 2009 (11 a.m. to 5 p.m.). Come and indulge in a unique and distinctive shopping experience highlighting local craftsmen and artists, eclectic food, children’s activities, a collectible car show, street performers, and live music. The fair will take place on 7th Avenue between Indian School and Campbell. For more information, visit the M7 Street Fair website, send an e-mail, or call 602-926-2758.